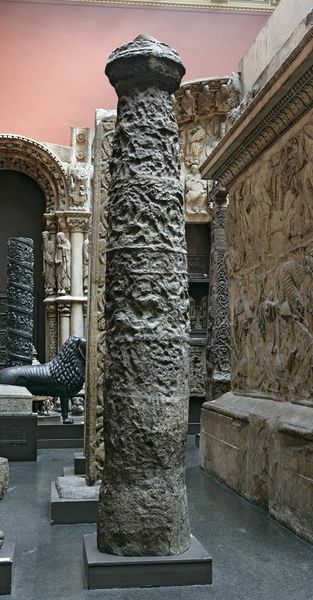 The Museum commissioned casts of a large number of standing crosses scattered across the British Isles. This enabled visitors to see them together and make comparisons. The original shaft of this one still stands where it was first erected outside in the churchyard of St Peter’s Church, Wolverhampton. The plaster cast, made in 1880, reveals some of the cross’s complex sculptural decoration, since lost on the original through weathering. Plaster cast of a standing cross shaft, from St. Peter's Gardens, Wolverhampton. Cast of a standing cross shaft made in plaster by Sergeant Bullen for the South Kensington Museum in London about 1877. The original was made by an unknown artist in sandstone in Wolverhampton about 850 and is in the yard of St Peter's Church. Plaster cast of a standing cross shaft made by Sergeant Bullen for the South Kensington Museum in London about 1877. The original was made in Wolverhampton about 850.